Sid wrote: 2 shows ago Larson also said, Kuster was coming back next season, so that puts us at 10 Defensemen for 19-20. Achan is either leaving early and or Ziemer is going to get pushed back or cut (although pushing Ziemer back 1 year, puts us at 12 Defensemen in 20-21). Technically, hockey teams can carry as many players as they want, but they only have 18 scholarships to divide up between them and there are only so many players they can dress or have locker room stalls for. Also heard that Ryan Poehling's good buddy Enebak is still going to come in as a walk-on and that Ryan may stick around due in part to Enabak plus an attempt at pursuing free agency. What does all that mean? I have no idea, but I expect Jaycox, Anderson, Perbix, Bushy, and Meier to get plenty of ice time and Zins and Trejbal should get every opportunity to play right away. That's seven WITHOUT Ahcan or Kuster. I don't see how Kuster gets any time, much less Zeimer. So, even if Zeimer is deferred and Ahcan leaves, Kuster will still be the odd man out. Huskies will have another talented blueline next year no matter what. Boy I hope you're right on Poehling but I doubt it. Perhaps Michaud can take his spot, assuming we can convince him to transfer here. Michaud From CC? Is that on the table? No idea if he is interested in us, but hes in the transfer portal and looking to stay in NCHC. Perhaps UMD since he's from up there, I believe. Freshman D Bryan Yoon really stood out for CC this year just like Scott Perunovich for UMD last year. SCSU Graduate Programs...includes History M.A. M.S., Higher Education Ed. D and M.S. SCSU commit begins the next stage of his hockey career at St. Cloud State. 99 career regular season games and 23 playoff games later, it was one heck of a career as a Smoke Eater! Thank you for your time and contributions, @trevorzins7! Last edited by hockeypuck on 01 Apr 2019, 07:21, edited 5 times in total. Thanks Hockeypuck - you are the perennial MVP of this site for the links/info you provide! I'm pretty excited to see what Krannila/Okabe/Kupka bring to the table. Kupka had a great playoff run (I know he was an older player in the league) and Krannila/Okabe have plenty of upside. As TEO has said Trejbal and Zins will get plenty of chances and if Ahcan stays a top 4 of Ahcan-Perbix and Bushy-Meier would be great. Goaltending is "interesting" to say the least. Lamoreaux's stats don't inspire a ton of confidence but he was also asked to make 40+ saves a night on a terrible team. I wonder if Larson is keeping one eye on the transfer portal for goalies as well. I like Hrenak but I think we need someone to push him; he certainly didn't show well against AIC but no one did. 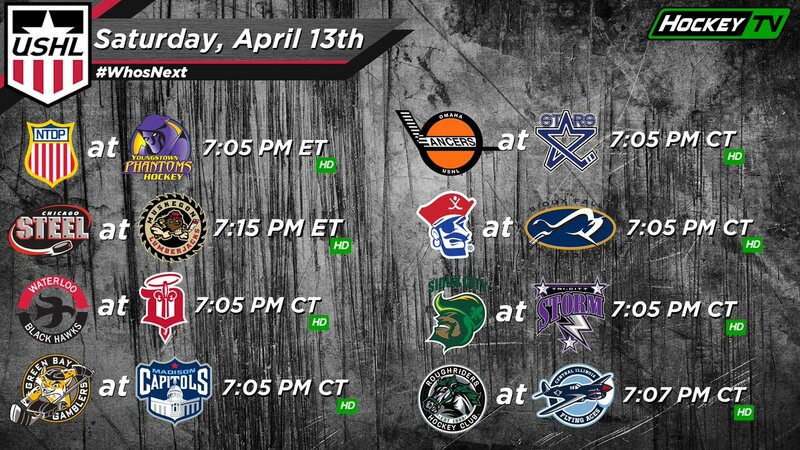 USHL wraps up their regular season this weekend. Last games are Sat. Apr 13. Joe Molenaar's Tri-City Storm lead the Western Conference and Jami Krannila's Sioux Falls Stampede are in 3rd and locked into the playoffs. Joe Lamoreaux's Madison Capitals are in last place in the Eastern Conference and will miss the playoffs. Trail Smoke Eaters (Trevor Zins) eliminated the Merritt Centennials (Brady Ziemer) 4 games to 1, Mar 1st- Mar 8th in the 1st round. In the second round the Smoke Eaters were eliminated by the Vernon Vipers in 7 games- 4 to 3, Mar 15th -Mar 25th. Ft. McMurray Oil Barons eliminated the Grand Prairie Storm (Zach Okabe) 3 games to 1 , Mar 7-11 in the first round. Kyler Kupka's Camrose Kodiaks won their first round series 3 games to 2 over the Calgary Mustangs. Mar 7-13. Camrose was eliminated in the 2nd round by the Okotoks Oilers 4 games to 1 , Mar 15-22. Regular Season concluded yesterday, Minnesota Wilderness (Ondrej Trejbal) didn't make the playoffs. Henry Eneback's Carleton Place Canadians eliminated the Navan Grads 4 games to 0, Mar 17th - Mar 22nd in the first round. CP Canadians eliminated Rockland Nationals 4 games to 1, Mar 31st - Apr 7th in the 2nd round. They start the 3rd round against the Ottawa Jr Senators shortly (Bogart Cup). Update, Joey Molenaar hasn't played for Tri-City since Mar 22. Asa Kinnear has been playing regularly. The 2018-19 regular season comes to a close with 8 games this evening. These teams were whittled down from the U16/17 Festivals representing all 8 sections held the last weekend in March in Plymouth. You'll notice a lot of names, Grant Ahcan , local Cathedral kids etc. I am sure Coach Larson and a bunch of the college coaches will be there. The two Minnesota boys’ teams set to participate in the 2019 Boys NIT are comprised of the most outstanding players from the 2019 Ted Brill Great 8 Tournament that took place March 29-31 at Doug Woog Arena in South St. Paul. One team of players was selected from the Senior teams and another team was chosen from players on the HP 18 (Juniors) teams at the Great 8 Festival. These teams were whittled down from the U16/17/18 Festivals representing all 8 sections held the last weekend in March in Plymouth.